I happen to be one of the people who read it late because it came out back in July. Honestly, when I started blogging I had this fear/hatred towards contemporary because of the label "chick flick". It never really clicked to me because I'm more of a tomboy and up till two years ago, I couldn't stand physical contact between two characters. Yes, the maturity is high in this room. But thinking about that, it makes this book feel extra special because it was supposedly a kind of book I swore to never like. Described as Pretty in Pink meets Pride and Prejudice, this book deals with an easy topic in a mature, intelligent way. I have not read either Pride and Prejudice or Pretty in Pink so I had nothing to go on when reading. I was completely unprepared for this book; it played with my emotions and ultimately made me sad when I turned the final page. This book is contemporary at its highest and filled with all things that would make any junkie squeal. I loved so many things about this novel that I'd honestly try to forget the bad things or not acknowledge them. Caymen Meyers is everything I'd ever want to be wrapped up in a ribbon made of sarcastic wit. She is just such an amazing, lovable character. Despite being in a poor state, she's still trying to make the best out of everything. And back to her wit; I like her wit very much. She is such a funny character who made me laugh at every turn. I don't think there could've been a better -fit character for a story of this sort. Love interest Xander Spence is what I call the balance. He balances Caymen out in a way that makes them truly perfect soulmates. I see him as someone who is an angel compliments and helps Caymen at her worst. Despite Caymen making her distaste for "rich people" known, Xander takes an interest in her and genuinely cares for her in a way where a lot of girls want to be cared for. Xander and Caymen are perfect for each other in the sense that they move the story along as well as making each other happy. The development between characters as time went one was also evident. 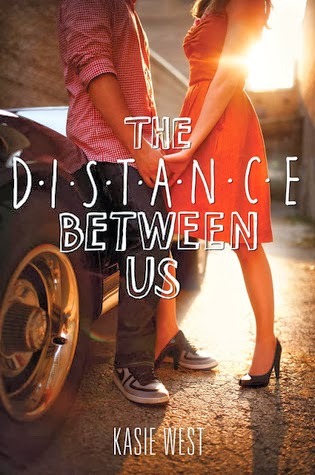 The Distance Between Us is most memorable for it's wit, sarcasm and concept on how love can conquer all. Kasie West writes flawless dialogue appearing as easily as sending a tweet. I also felt as if I were a part of this story and if I could pitch a book to turn into a film, this would be one of my top choices. I highly recomend this book as I read it so late and now regret not reading it sooner.